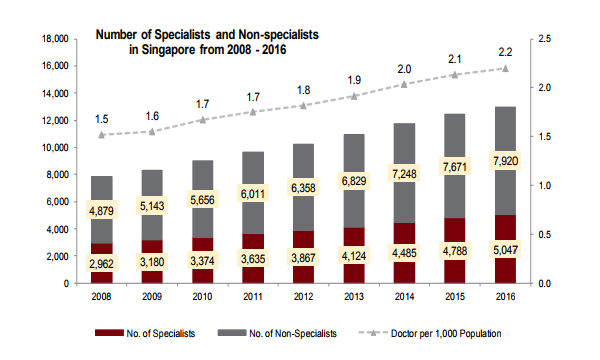 This chart from CIMB Research shows the number of doctors in Singapore rose at a CAGR of 6.5%, improving the overall doctor per 1,000 population ratio from 1.5 to 2.2. This is supported by an expanding annual medical student intake into local universities from 354 in 2012 to 471 in 2016, as well as returning Singaporean doctors who are trained overseas. CIMB said the figure is in the lower range for developed nations. As of the of the end of 2016, the medical talent pool is made up of 84% local doctors, and Ministry of Health (MOH) projects it to further grow to 500 in 2018.